These are photos of nearly empty clothing racks in our PIN Bank. It’s springtime, and Lethbridge experiences a wide range of temperatures, meaning that our clients need layers of clothing to be comfortable in these varying conditions. Unfortunately, many of our clients have no fixed address. This means that they have nowhere to store their extra clothing, and often lose coats, or have the jackets taken from them by others. That means that we share a lot of these items in the PIN Bank at this time of year! 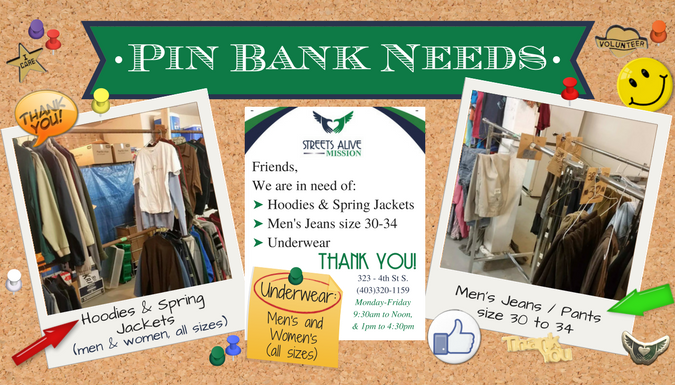 We gratefully accept donations of clothing, shoes, bedding, small household items, etc., at our office. 323 – 4th St South, Lethbridge. Office hours are Monday to Friday, 9:30am to Noon, and 1pm to 4:30pm (closed for lunch from 12-1pm). You can also donate financially toward the purchase of underwear or other needed items. Visit our Mission Market to select specific needs to support. Thank you so much for your generosity. We can’t say it enough! Every donation helps, and you really do make a difference!! « Previous Post: Volunteers are Invaluable!